BigBelly trash and recycling receptacles. Boston already has lots of BigBellys. And it’s getting many more. The city will install 400 solar-powered BigBelly trash and recycling receptacles around town over the next year. And these aren’t just any waste bins. They have built-in compactors that squeeze trash so each bin can hold more garbage — and they’re going to be free for the city. New York outdoor advertising agency Vector Media, which has a Boston office, is paying to install and maintain the units in exchange for putting advertising on the boxy, 4-foot-tall receptacles. That will result in a $3 million savings for Boston, according to city officials. The new bins will triple the number of BigBellys here, replacing about a third of the city’s trash cans. Boston already had 176 of the units, which are made by BigBelly Solar Inc. in Newton. “The rollout of these solar-powered collectors will give residents and visitors better options to dispose of their rubbish and recyclables, which will make our city cleaner and greener,” said Mayor Thomas M. Menino in a statement. Marc Borzykowski, general counsel for Vector Media, said the company is betting that BigBelly will be an attractive medium for advertisers, who will want to be associated with the green image of the solar-powered bins. “We wouldn’t have done the deal if we didn’t think there was interest,” he said. Borzykowski said potential advertisers include airlines, banks, and any company whose products are recycled, such as bottled water producers. The city will also provide public service messages that will be displayed on 10 percent of its BigBelly bins. As part of the agreement with Boston, Vector has agreed to return a minimum of $250,000 in advertising revenue back to Boston over the next five years. Boston first installed BigBellys in 2006. Each trash can includes sensors that deploy a trash compactor when the cans fill up. The new units feature wireless Internet connections, so city workers can check the status of an individual trash can on a smartphone. Having that kind of information means the city will spend a lot less time emptying litter baskets, said Joanne Massaro, Boston’s commissioner of public works. Conventional city trash cans are emptied an average of 14 times a week, she said; the city empties BigBelly only four times a week. The technology comes at a steep price, however. 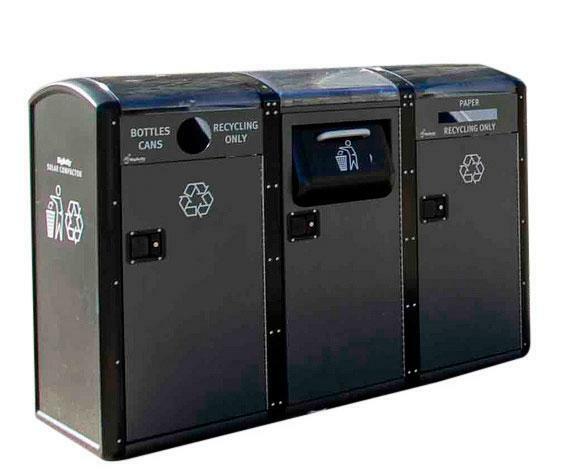 The new BigBelly units costs about $6,000, compared with $100 to $800 for a normal litter bin. 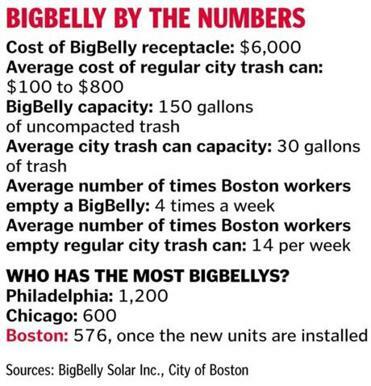 But over time, Boston will save money, said Rick Gaudette, BigBelly’s northeast sales director. The decreased manpower needed to maintain BigBellys, he said, means municipalities will spend between $400 to $600 a year emptying each bin — a discount over regular trash cans, which cost up to 2,000 a year to maintain. Boston will have the third-highest number of the solar-powered bins in the country, behind Philadelphia, which has 1,200 of the bins, and Chicago, which has about 600. BigBelly has installed 14,000 of the compacting trash cans in 30 countries.